* Add Scanner Radio widgets and shortcuts to your phone’s home screen for quick access (app cannot be installed on SD card to access them). * Add a \”Scanner Radio Favorite\” shortcut to your home screen to launch a scanner feed via an alarm clock app or automation app. * Listen to Broadcastify.com’s audio archives to listen to audio that’s been archived over the past 30 days. Note: You *must* have an account on Broadcastify.com and purchase their \”Premium Membership\” ($15 for 6 months) in order to access their archives using the app. * The Pro version contains no ads. 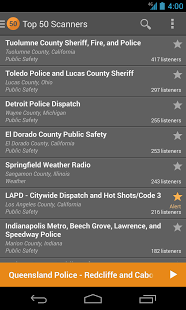 * With the \”Scanner Radio Pro Locale PlgIn\” plug-in is also installed you can have Locale/Tasker launch the app and have one of your Favorites automatically begin playing based on one or more conditions or have the app stop playing. One use for this feature is to have a scanner feed begin playing when your phone connects to a specific Bluetooth device and then have it stop when the connection to that Bluetooth device is no longer present. The \”Phone Calls / Read Phone State\” permission is needed by the app so that it can detect when you’re placing a phone call (or when one is being received) so that it can automatically stop the streaming of the audio to prevent it from interfering with the call. The \”Fine (GPS) Location\” and \”Coarse Location\” permissions are required so that the app can determine what scanners are located in your area when you click on \”Near Me\”. When you click on \”Near Me\” the app first attempts to determine your location via the network, if that fails the app then tries to determine your location via GPS. The \”Automatically Start at Boot\” permission is required so that a small portion of the app can be started when your phone boots if (and only if) you turn on the notifications feature of the app (that feature is turned off by default). 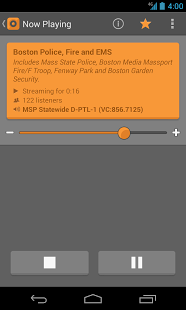 If the audio repeats or the app stays connected for only a short time, try returning to a directory screen in the app, then select \”Settings\” from the menu, then \”Player settings\”, and then try changing the \”Streaming method\” setting. 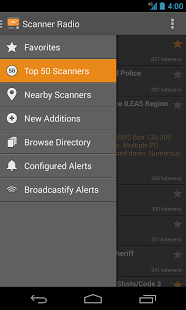 Follow \”Scanner Radio\” on Facebook or ScannerRadio on Twitter to be notified about tips, service interruptions, new beta versions, etc.